Healthcare@: Majority Leader Chuck Schumer? This election, the United States Senate is hanging by a thread. And I do NOT want to wake up in November and hear these words: Majority Leader Chuck Schumer. I know you don’t either. So I am working hard to help my colleagues in tough races get re-elected across the country, and we need your help right now making sure Senators Kelly Ayotte of New Hampshire, Roy Blunt of Missouri, Richard Burr of North Carolina, Chuck Grassley of Iowa, Rob Portman of Ohio, and Pat Toomey of Pennsylvania have the resources they need to win re-election. Can we count on you with a contribution of $250, $100, or even $50 right now? All money raised will be split evenly between these six critical races and go directly toward their campaigns. The stakes couldn’t be higher. If Democrats take back the Senate we will see an increase in job-killing regulation and legislation, illegal immigration will continue unfettered, new fronts will be opened in the war on oil and gas – and we can forget about repealing Obamacare. I don’t want to watch the news on November 9th and wonder if there were anything else we could have done to prevent the Senate from being put back in Democratic hands – Chuck Schumer’s hands – and I know you don’t either. 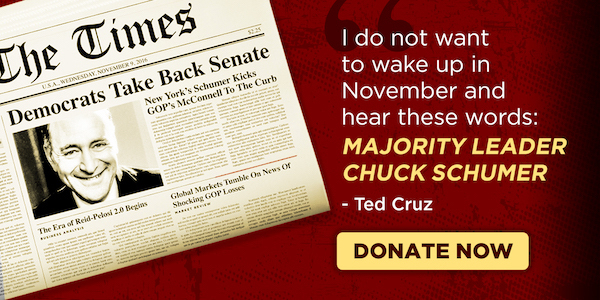 Can I count on you to help protect our Republican majority in the U.S. Senate right now? Whether it is $50, $100, $250, or more, every dollar you contribute right now will go directly to helping senators in some of the toughest races in the nation. P.S. You can have an enormous impact – right now – in ensuring Majority Leader Chuck Schumer never becomes a reality. Can we count on your support?